Last weekend I was finally able to try a restaurant I have been dying to try for SO long and I am pumped to finally be sharing it with you guys! The restaurant is called Flower Child, which is amazingly fitting when you see the totally groovy wall that they have inside. Now lets get down to the food. Everything in Flower Child is all natural and organic, which I absolutely adore since I am a complete health nut. Honestly everything on the menu looked amazing but I finally decided to go with the Flying Avocado wrap and Lemonade. 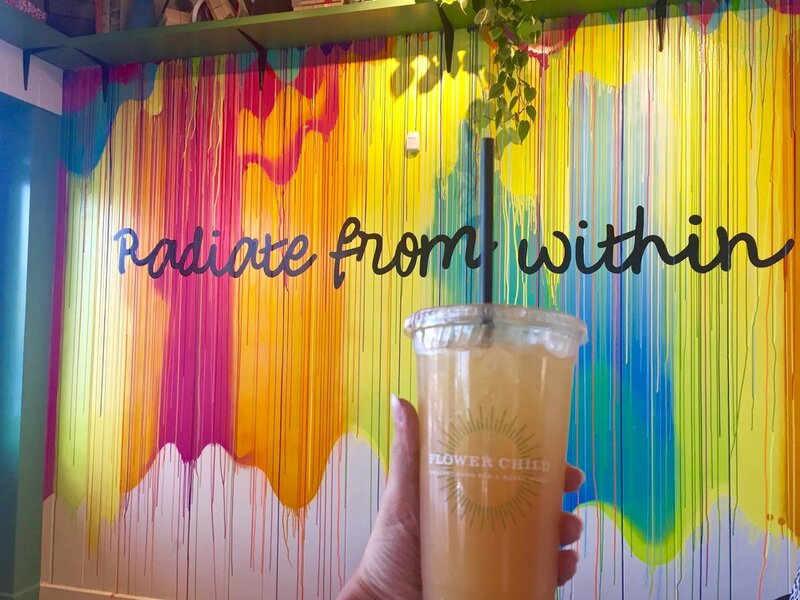 You can see their entire menu here>>> Flower Child Dallas Menu. The lemonade was delicious, you could definitely tell is was fresh and homemade. The wrap was fantastic. It had amazing flavour and you can definitely tell that it is being made fresh. The only critique I do have about it is I wish that they used sliced chicken breast in it instead of formed chicken. Other than that I loved it! Overall I would say Flower Child was a success. I definitely recommend that you guys try it out if you happen to have one near you. I am looking forward to exploring their wonderful menu further.